I finally finished this scarf which I started at the end of last year. I should probablyblock but I a) couldn’t be arsed and b) am not quite sure how to block this particular pattern. Might show my face at a SnB in the near future… stranger things have happened. That is an awesome stitch pattern, I love it. Glad to see you are back. Hope you are feeling well. What a great scarf! What is that pattern? It’s simply beautiful. Looks great just as it is! I knit one out of silky wool and didn’t block it — it’s my favorite scarf. Thanks for the nice comments, peeps. 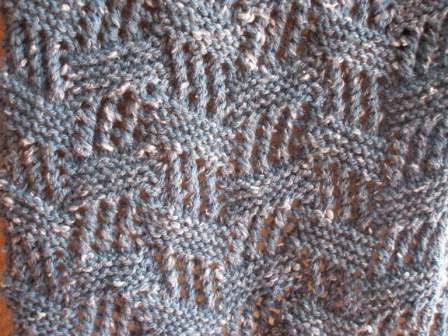 Hope – I got the pattern from a book called Scarf Style by Pam Allen of Interweave Knits fame. It has some fantastic scarf patterns.